Many times it is confusing to do the conversion between Indian numbering system. 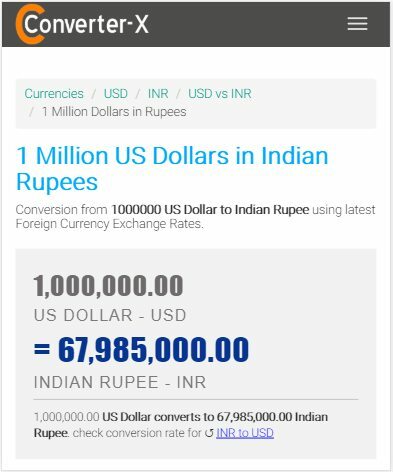 Below table does this conversion for you and also converts the Amount in Indian Currency. Please note that USD live rates have been used from Yahoo finance. In case you are doing some online transaction you need to refer conversion rates from your bank or financial institution. In case you want to convert several currencies you can user online portals which can do the conversion with live currency rates. One such popular website is 1 million dollars in rupees Best thing about this site is that it is optimized for mobile devices and able to do the live conversion for you. 1 Million in Rupees website detail page.